On the water beneath moody skies along Sleat point, Isle of Skye. A dark and moody Ardnamurchan point in the far distance. Enjoying warm Autumn sunshine on Loch Eishort. Looking across to the Black and Red Cuillin whilst keeping one eye open for the infamous ‘Each Uidge Earballoch’ (the long tailed water horse) – a rare, mischievous beast reported to swim in shore only twice a year. The only known remains lie washed up upon a rock on the shores of Ord bay and dates from 1967. Not all that long ago!!! Paddling back to shore under a chilly but stunning afternoon light after spending the day exploring castle ruins, coral beaches, and talking celtic legends. Isle of Rum in the background. A sandy spot below a storm beach. Not a bad lunch stop. Loch Eishort, Isle of Skye. Its always a treat to be allowed to explore such beautiful places. To help give back a little to the environment it took 5 of us 8 minutes to remove 3 bin bags of rubbish washed up by stormy high tides – our kayaks were a lot heavier on the way home but a worthwhile job. One of the first views to entice us ever onwards into the jaws of the Black Cuillin. A moody and chilly day with fantastic ambience. Rain, wind, sleet and sun provided a magical dance of light and threw up an array of rainbows in their wake. Arriving in Loch Scavaig beneath the mighty Cuillin, and going ashore to explore Loch Coruisk, it is difficult not to feel the irony and contrast of magic and menace, beauty and broodiness. A place of myth, legend and folklore – It’s the closest I can imagine to paddling into the bowels of the earth without being eaten by dragons or meeting the celtic warrior Cuchulainn himself. 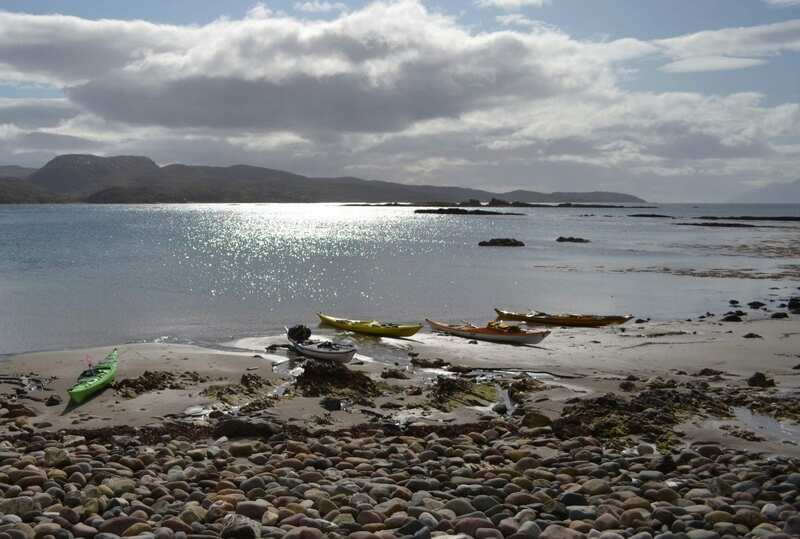 A truly special place and my all time favourite paddle destination in Scotland. A downwind run after leaving Loch Scavaig and the Cuillin behind, this time with the view towards the Isle of Rum and the almost as beautiful (but not quite!) Rum Cuillin. The Isle of Eigg also making an appearance in the background. Sometimes kayak adventures are not just about the sea. Taking time to stop and appreciate the beauty of the Isle of Skye’s landscapes and to share the early morning musings of this solitary cow. Kayaking deeper into the fjord-like Loch Scavaig, a watery and sometimes stormy guardian to the breathtaking inland Loch Coruisk at the foot of the Black Cuillin. A foreboding and threatening cloak of mist finally lifted to reveal the continuing ridge line of these infamous mountains. As a cold north wind set in on the leading edge of a wintry blue sky it became the perfect place to stop and share a brew, soak up the magic and, of course, all the while looking over our shoulder for that other long tailed water horse that is said to lurk beneath Coruisk’s dark and chilly surface.